A classic National Literacy Trust competition. Over 1,400 entries. Just one winner: North Bridge House Prep School’s Alex Dimitriou. 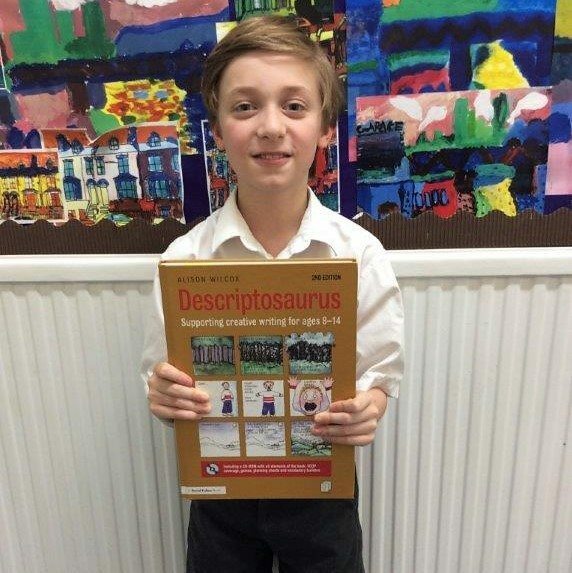 The talented Year 6 pupil won the Descriptosaurus Time Machine competition with 350 words of creative genius set in the time of French Revolution. Inspired by the popular Descriptosaurus series by Routledge, the National Literacy Trust’s competition challenged students to produce a piece of descriptive writing set in the past, present or future. Alongside his classmates, who also enjoyed taking part in the challenge, Alex travelled back in time to craft a very vivid tale around the Setting – Character – Interaction – Reaction (SCIR) concept studied in class. You can read his winning entry, Saint Guillotine below. “The Descriptosaurus challenge took me into a world of literature. If I wasn’t at school when I heard the news [that I’d won], I would have fainted on the spot!” said Alex. As the overall winner of the competition – category winners and runners up were also selected – Alex won an eReader and £50 worth of book tokens, plus £250 worth of Routledge books and membership to the National Literacy Trust Network for the school. Alison Wilcox, author of Descriptosaurus Time Machine, will also be paying a highly anticipated visit to NBH Prep to run workshops with Alex and his classmates. From 17th Century Japan to a distant drought land in the year 10,999, all participating Year 6 NBH pupils really stretched their imaginations with the Descriptosaurus competition and found real purpose in their writing. We congratulate all of them and of course our overall winner, Alex. Well done! Listen! The rumbling of the sin carrier enclosing despicable lives in its splintered arms as its despondent wheels roll down the rutted cobbled street. Hear the wails of terror of the condemned unfortunate aristocrats, once living their lives in harmony and privilege, now see them quivering against the sides of their carriage to hell. Dirty, torn clothes, once a peacock’s finery and now rags of shame and despair. I feel no mercy, my rage fills me like a cavern of fire as I look down at the mud covered feet and rough working clothes around me. I hear the Sans Culottes name with pride. I have seen hardship which has torn at lives like a misanthropic monster consuming pieces of humanity until no kindness is left. I am sharp as a razor. Shining with a single minded purpose. I must be fed. It comes nearer carrying its doom-laden lives, prayers falling like the teardrops from forsaken eyes onto the sneering crowd. A cackle rises above the baying people looking for its huddled victims, who wish their lives back once more in their grasp. Each person must ascend these last wooden steps to the platform alone and, in their own way, pave their path to judgement. I have seen pride on faces, badges of defiance, as well as souls suffocated in terror trembling as they watch their lives fly away from them. I have even seen theatrical displays, begging for laughs before descending to hell. Always present, the faithful witches cackling at misfortune and looking for more. Hellish creatures, knitting and watching, using yarn to weave victims’ last moments into scarves of misery and horror. Feeling vengeful and justified, jubilant in their pride at finally being first in a crowd and seeing their lords and ladies brought low. I must be used. I am sharp and dangerous and should be handled with care. One man understands me and looks after me with admiration. I am feared outside my own land. The sun’s light bounces off me and a shadow of death falls before me. Who am I? Saint Guillotine!